Why bother with a company vision? If you've ever wondered why you need one or how to go about making one... read on! My most inspirational role model ever! For the most practical minded amongst us, a company vision may seem a woolly, ‘pie in sky’ kind of ideal that really has no bearing on today’s sales. And in some ways this is true. A company vision is something that exists way out in the future and will most likely never be realised. However, it plays a critical role in your business success. Let me explain how. Firstly, a vision will inspire people. Your vision is not what you do, it’s the reason your business exists and how it makes a difference. Perhaps you’ll remember earlier on the book I talked about the two reasons for being in business. The first was to make money (and hopefully you are on board with this idea by now!). The second was to make a difference. A business that sets out to change something is a business with a purpose. And a business with a purpose is one that propels forward, gathers speed and brings people along for the ride… people who care about the same purpose and want to make that change too. The people that work for you, the clients you attract and ultimately the buyer who pays your asking price – they can all be inspired by the vision your business shows them. Your desire to change something significant can form a powerful motivator. This change can be within your own industry, if you can see better ways of doing things that will transform the way your industry operates. It could be a difference made to your community, your city, your country or on a global scale. A well considered company vision can also stamp your mark on your industry in a way your competitors may not have thought of. My vision for Red Rocks was to ‘transform the way advertising agencies treated their clients’. I had spent my entire working life in an agency, most of this as a creative person. My experience told me that advertising agencies treated their clients almost with a level of distain. The client was a pain to be tolerated on the road to a creative award and quite literally a meal ticket, needed to cover the costs of excessive long lunches. The agency would take the client’s brief and disappear for several weeks while they worked on the big idea. As a copywriter I was mostly kept separate from the client and had to rely on the brief from the client service person (or ‘suit’ as the industry nicknamed such roles). There was, in my view, a big disconnect between the clients, who had all the industry knowledge, and the creative people who came up with the clever ideas. Surely we should all work together to get the best solution? I hated the arrogance that seemed to go with my own industry and the way clients were kept out in the cold. So when I started my own agency, it was with a vision to change this… and make a difference to the industry that would live beyond my own tenure as the agency owner. The vision had our clients’ best interests at heart and we made sure we used this to our advantage when pitching against our larger competitors. Did we point out the arrogance that bothered me? Of course we did, and positioned ourselves as the opposite. On many occasions it worked extremely well for us. ‘You’ll find what you love by observing what you hate’. Robert Kiyosaki said the above words to me as we sat having dinner one night during his Business School for Entrepreneurs in Hawaii. I’ve never forgotten them, nor stopped admiring the work Robert and Kim do to this day to make their difference in the world. 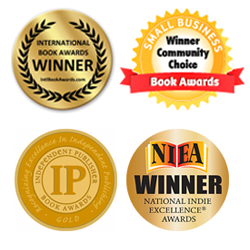 If you take a look at Robert’s web site www.richdad.com you’ll see his vision right there on the home page: “Elevating the financial well-being of humanity”. It’s a vision that flows directly from his hatred of poverty and the terrible impact it has on people. If you can find something that is frustrating you and other people out there, you can steer your vision towards fixing it. Our vision for our pet care company was ‘to make the world a happier place for pets’. This was clearly a global vision and one inspired not only by our love of pets but also by our hatred for any kind of animal cruelty. Although our core business was walking dogs and feeding cats, we saw our role in the world to be much bigger than this. We envisioned ‘an army of Pet Angels across the globe’, all committed to making a difference. Our vision enabled us to think and act on a much bigger scale than our core services. We became involved with raising funds for our local animal shelter, petitioning for more dog lighting in dog exercise areas, creating pet first aid and emergency training guides, teaching pet handling safety in schools. Everything we did was measured against our vision and enabled us to keep asking ‘will this help make the world a happier place for pets?’As a result of these activities we often found ourselves in the newspapers, or being asked to comment on important pet related issues. We had a voice bigger than our services, and we championed a cause that many people could get behind. From a CEO point of view your role is to keep focus on the vision to drive the business forward. Ultimately your company vision is what unites your people around a common purpose that goes beyond the money. It’s about doing something you love and wanting to change the world. It’s most important role is to inspire. My vision for my work with The Liber8 Factor and other liber8yourbusiness programmes is “to set all small business owners financially free”. Of course this vision will never be achieved in my lifetime, but by making this my ideal I am clear that everything produced under the Liber8 brand must increase the chance of this vision happening. There are millions upon millions of small business owners in the world, so whatever Liber8 does must be accessible to as many people as possible. This vision will inspire me and those I work with to keep thinking of more ways to bring the Liber8 message to business owners everywhere. The Pet Angels vision ‘to make the world a happier place for pets’ was an ideal both my business partner and I loved and felt inspired by. We never intended that it be measureable or even achievable. How could we ever know if we really did make the world a happier place for pets? This is the key difference between a company vision and your business goals. Your target and goals are there to be achieved within clearly defined timeframes. Your company vision, however, is there to inspire, not be measured. Most company visions are created to have a life beyond that of the original owner. Anita wanted to change the way ‘business is carried out’ by demonstrating that business can have high ethics, values and a greater cause behind everything her company did. In her lifetime she may not have changed the ethics of every business on the planet, but she certainly demonstrated how a business can combine financial returns whilst championing a cause for good. I hope from the above you get a sense of how important it is for you, as the business owner, to be a visionary and create an inspirational vision for your company. For an exercise on how to do this, you’ll have to buy my book, The Liber8 Factor. 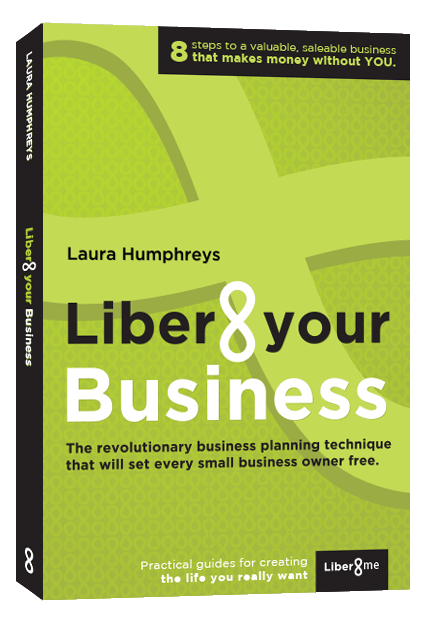 You can pre-order your copy now by emailing me laura@liber8yourbusiness.com. From the desk of liber8yourbusiness. Creating tools to set you free. This entry was posted in All, Business Planning, Team Performance and tagged business, Business advice, Business blogs, business coaching, Business mentoring, business owners, Business partnerships, business planning, company vision, Planning an exit strategy, small business mentor. Bookmark the permalink.